Weeks ago, Disney announced via Facebook that they were offering free family decals as a way to promote the “Show Your Disney Side” campaign. Guests can log in to the Build Your Disney Side website and customize a decal. The website allows guest to choose their background; which consists of the famous icons at each theme park. You then select your family members (pets too) and add accessories and clothing. Once finished, you are given the option to have a decal mailed within 4-6 weeks. Guests can also save the picture and use it on social media profiles. After weeks of patiently waiting, our sticker arrived yesterday. I was like Ralphie in “A Christmas Story” when he got the decoder pin…so excited that I was tearing open the envelope right in the driveway! The contents were a personalized marketing brochure highlighting the Show Your Disney side campaign and it encourages vacation planning…along with ride suggestions that may be of interest. The decal itself is not at all what I imagined. It is more like a bumper sticker, so guests cannot place it on the rear window of their car. I can’t say that I was disappointed (because it was free) but it just wasn’t what I expected. I had some car magnets that were purchased from a craft store a while back and ended up cutting the decal and sticking it to the magnet. This way, if we decide to display it on our car, it can be easily removed when needed. 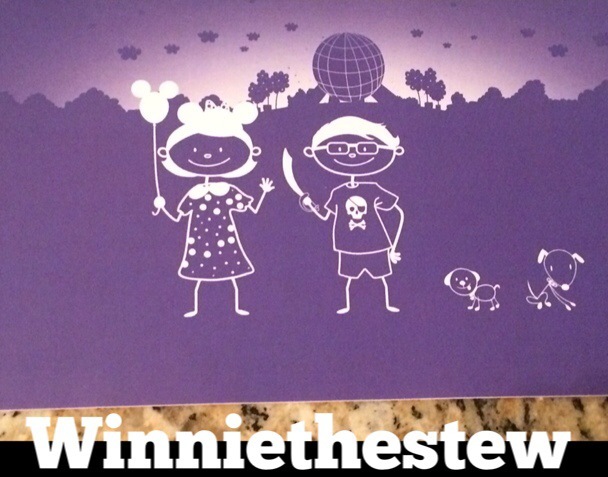 If you have not created a Build Your Disney Side family decal yet, I would highly recommend the process. It is a lot of fun and makes for a fantastic Facebook profile picture!